Home > TARGET > Target: 24 Bounty Giant Paper Towel Rolls (= 36 Reg Size Rolls) Only $29.97 + Get A $10 Target Gift Card!! Target: 24 Bounty Giant Paper Towel Rolls (= 36 Reg Size Rolls) Only $29.97 + Get A $10 Target Gift Card!! February 20, 2017 1 Comment on Target: 24 Bounty Giant Paper Towel Rolls (= 36 Reg Size Rolls) Only $29.97 + Get A $10 Target Gift Card!! 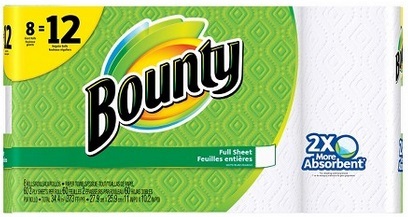 Target has the Bounty White Paper Towels 8 Giant Rolls (which equals 12 regular size rolls) priced at $9.99, and when you buy 3 packs you’ll automatically get a $10 Target gift card added to your cart. So if you buy 3 packs, you will be getting 16 giant rolls (which equals 36 regular size rolls) for only $29.97 + get a $10 Target gift card, making it like just $19.97 after getting the gift card! Use your Target RedCard to save an additional 5% off.